When I was at NIDA, there was a wonderful story that used to amuse us acting students no end. 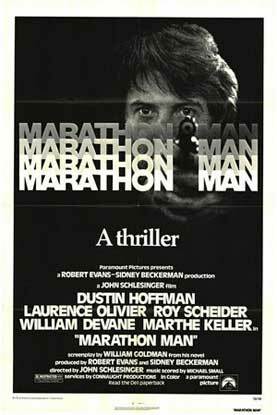 It was about Dustin Hoffman and Laurence Olivier on the set of the thriller Marathon Man. Hoffman was playing the lead character Babe, a young history student caught up in a terrifying web of evil that saw him subjected to a three day dental appointment with Nazi war criminal Christian Szell, brilliantly played by the consummate thespian Olivier. Being the method actor that he was, Hoffman fronted up to the shoot a jangled mess, not having been to bed for the requisite three days. When Olivier found out about this he said; “Dear Boy, why don’t you just try acting?” It was vindication from the great man himself that we needn’t drive ourselves insane with first hand experience of our character’s dilemmas but rather use our powers of imagination to conjure up authentic facsimiles and survive to play another day. Now, in a documentary accompanying the DVD release of the film, we have the true story from the horses mouth. Hoffman reveals that he stayed up for three days, not for art but for fun; “Those were the days of wine and roses… and Studio 54” he recalls with a twinkle in his eye. The infamous New York disco, it seems, helped him achieve that haggard look. And when you’re nudging forty, as he was, raging all night takes its toll. What’s more, far from the contempt that Olivier displays in the overblown legend, Hoffman reveals that there was a deep affection between he and the man he called ‘Lordage’. When he tells of how Olivier gave him a box of treasured books on and by Shakespeare, it’s all he can do to hold back the tears. It’s obvious, not only from Hoffman’s accounts but from those of ace producer Robert Evans, director John Schlesinger and actors Roy Schieder and Marthe Keller that the experience of working on Marathon Man was something special. And watching the film, even if for the umpteenth time, one feels that intrinsic dynamic. All the cinematic elements conspire to ensnare the viewer; from the suspenseful soundtrack to the brilliant camera work, everything drives the plot relentlessly forwards. Like Babe, we are initially innocent and unsuspecting of the collision course we are on. But as he embarks on his thesis on tyranny, likewise brace yourself for a crash course on the subject that no amount of lectures or books could ever prepare you for.